In May 2010, Ray Boltz and I were in Long Beach, California as part of our national tour, Living True, and so was the Phelps family of Westboro Baptist Church. The Westboro Baptist Church primarily consists of the Phelps family. They’re famous for protesting American soldiers funerals and gay events, such as the one Ray and I were attending. 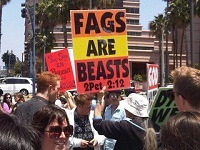 Their signs such as, “God hates fags” and “Thank God for dead soldiers” have infuriated people all over the world. Their hateful message has even led to a lawsuit which ended up before the Supreme Court. I heard the Phelps family would be in Long Beach the same weekend as Ray and I, but I didn’t expect them to be outside my hotel. When I woke up that Saturday morning, I heard shouting outside my hotel room. I went over to the window and pulled back the curtain. There they were, ten stories below me, with their infamous signs in tow. I immediately became excited. I had wanted to meet the Phelps family for years. There were so many things I’d thought about saying to them. However, since my transition from a faith based in fear to a faith based in love, I no longer had the desire to provoke them. I wanted to show them love instead. Instead of responding to them out of fear, I could only think, “How can I show them love?” What would that look like? I found a corner store nearby and bought five bottles of water. I figured it was warm that day and they might be thirsty. Estranged son of Fred Phelps, Nate Phelps, has recently started speaking out about his experience of growing up in the Phelps family. In an interview with The Standard, Nate revealed his father, Fred, would physically beat his mother and siblings for hours. Because of that interview, when I saw them outside my hotel window that Saturday morning, I no longer saw people who hate me because I’m gay; I saw victims of Fred Phelps. I saw people who have never experienced love and are controlled by the fear of going to hell. As I approached them, I grew nervous, but I went up to each one and asked, “Are you thirsty?” All of them declined as I thought they would. “Well, if you get thirsty, here is some water. It’s warm out, you need to stay hydrated.” Before I walked away, I looked at each of them in the eyes and told them, “I want you to know you’re loved.” Only one of them responded, her name is Mara Phelps. If it wasn’t for God’s love transforming me, I would have only joined the 50+ counter protesters and argued with the victims of Fred Phelps. However, I chose to retire my angry thoughts and instead show love. That Saturday morning I made a new friend. Her name is Mara Phelps and God loves her.